Use TBTGAP to reference this item. 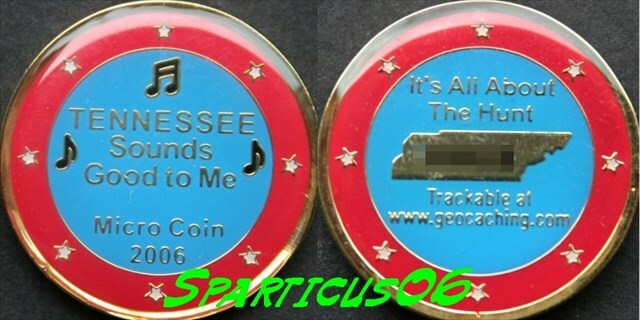 My mission is to first reach Arkansas (cache GCGQ10 ) to meet my new owner...then to be re-released into the cache wilderness. Seeing many places and taking pictures of your favorite spots in your towns/states. Please don't keep me long...I want to see the world. Thank You Sparticus06 for this coin! This coin is a part of the Pay it Forward Geocoin Adoptions The premise is that those who have extra activated geocoins that may be doubles, coins that are no longer wanted, coins that will not sell or released coins someone does not want to keep track of, etc... For whatever reason, adopt them to someone who wants to see their own coin travel. This one needed some more millage and as I'm not likely to head south for a while I figured north was more of an adventure. Happy trails! Discovered at Taco Tuesday event. Thanks for sharing. Grabbed from Taco Tuesday. Will move it along. Had a nice visit now to get to Illinois. Will be taking to Illinois. Dropped this trackable after a long break from caching.